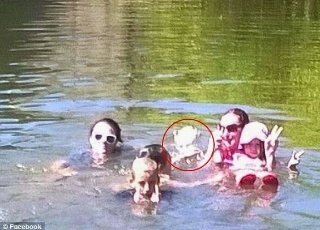 Australian woman Kim Davison posted this chilling image on Facebook saying a ‘ghost baby’ photo-bombed her family photo. 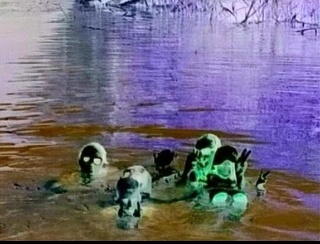 Davison said she was in the river with a female friend and their three children when the photo was taken in 2014 at Murphy’s Hole in Lockyer River, south-east Queensland, Australia but when they examined the photo later, they saw a 4th face in the background. “At the time of taking this photo there was nothing between us. I’m holding the little girl and that white head next to me with horns is not human, I can promise you that. Its fingers are on my shoulder and on my daughter’s arm. They are long skeletal type fingers,” Ms Davison said. It was later revealed that a little girl drowned in that same spot 100 years ago. 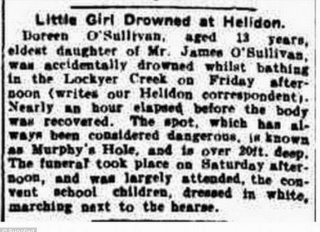 Newspaper clipping from November 22 1913 has a death notice for a little girl who died in that watering hole. 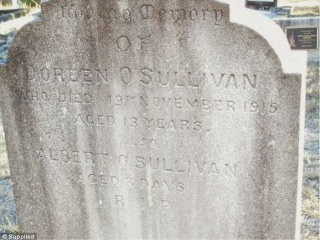 13 year old Doreen O’Sullivan drowned in the same creek in 1915. Doreen, the eldest daughter of Mr. James O’Sullivan accidentally drowned whilst bathing in the Lockyer Creek on Friday afternoon, according to the notice. Nearly an hour elapsed, before the body was recovered. The spot, which has always been considered dangerous, is known as Murphy’s Hole, and is over 20 foot deep.